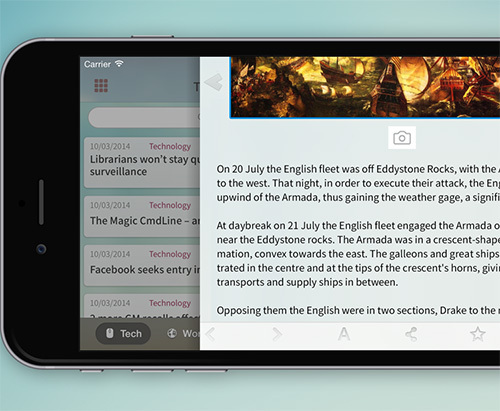 OwletLabs today releases its news aggregator app, Stardust News Reader 1.0.2, a unique information-gathering tool that is optimized for iPhone 6/iPhone 6 Plus. The app's characteristic is uniformity. All web articles are concurrently parsed by the app's machine learning engine & rendered as in human-readable form. The UI is animated & highly intuitive. Users can always keep one-handed operation. The app shows news that is buzzed on major social media in its initial state. Sources are extensible. [prMac.com] Tokyo, Japan - OwletLabs, LLC today is proud to announce the release of Stardust News Reader 1.0.2, its news aggregator app developed for iOS devices. Stardust News Reader is a new generation information-gathering tool that is designed to be completely "User-Oriented." Often the information we get from the web can get easily lost in annoying noise, with the character size lacking consistency from site to site and it being difficult to identify important sections, so finding what is truly necessary can be a struggle. Stardust News Reader is equipped with a powerful embedded optimize engine, and publicly published html contents are automatically converted to the display most appropriate for each device, to make, as it were, one unified application UI. Freed from the need to load unnecessary elements, the app operates at high speeds and as the user can freely change the outer appearance and choose the format that the user feels easiest for them to read, the focus can be purely on the content. Users completely take the initiative in relation to the information with unlimited sources of information and the user can expand the source by adding feeds in the same way as with normal readers. Moreover, the UI has been designed carefully in order to enable optimization of screen sizes and rotations for each device, and through extensive use of animation, operation is highly intuitive. Stardust is a completely stand alone reader, and can be used without reliance on external services or accounts. Users can use the app without divulging their personal information, receiving junk mails or being faced with the possibility of the providers stopping the service. 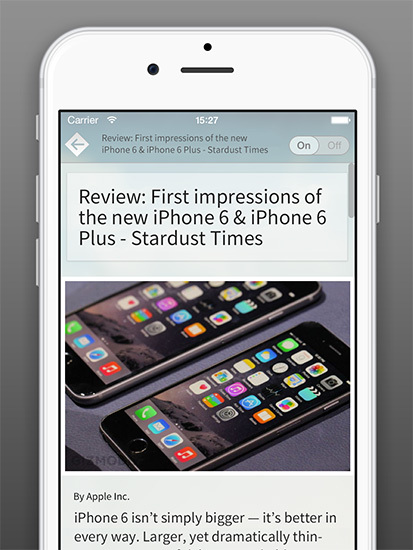 Stardust News Reader 1.0.2 is Free and available worldwide exclusively through the App Store in the News category. Located in Tokyo, OwletLabs, LLC is a software development company that was established in August 2014. The mission of OwletLabs is to create user-oriented tools for making people's lives more simplified. All Material and Software (C) Copyright 2014 OwletLabs, LLC. All Rights Reserved. Apple, the Apple logo, iPhone, iPod and iPad are registered trademarks of Apple Inc. in the U.S. and/or other countries. Other trademarks and registered trademarks may be the property of their respective owners.